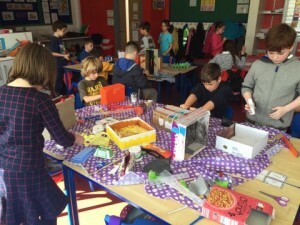 The Green School committee together with the Global Citizenship School scheme are joining the ‘NoMorePlasticPaddy campaign. 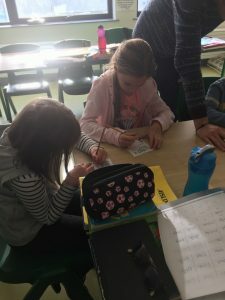 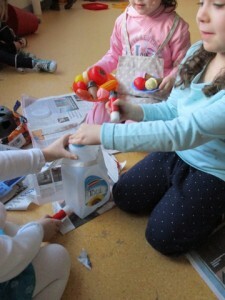 Members of the Green School Committee went from class to class March, teaching children about the effects of single use plastics and encouraging everyone to use re-usable lunchboxes and flasks. 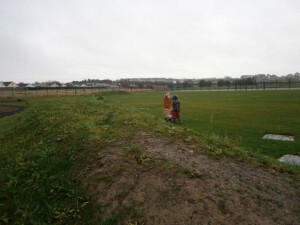 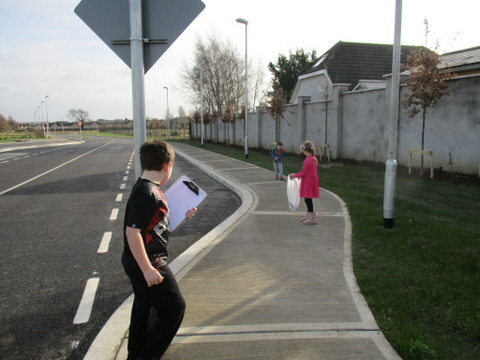 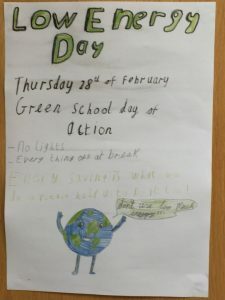 The Green School Committee held a day of action on Thursday February 28th. 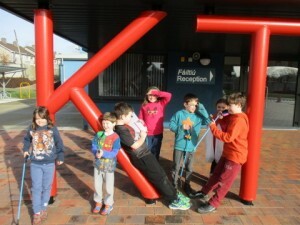 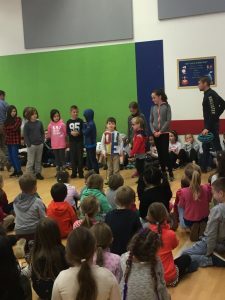 They organised a Low energy day at school. 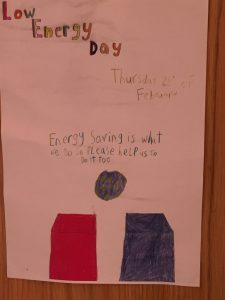 We used 48kWh electricity on this day which is almost a 50% reduction on the previous two weeks electricity meter readings. 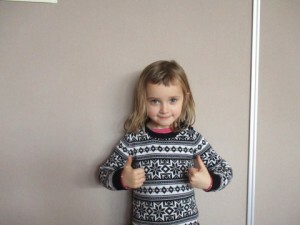 The target set for daily electricity usage from now until June is less than 75kWh based on this result. 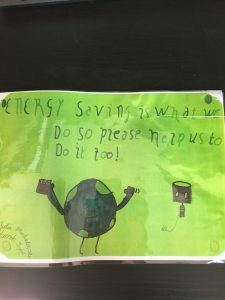 The Green School committee continue to fill the role of energy wardens and will be reminding staff and students to switch off appliances when not in use, turn off lights, turn off switches and standby lights and cut down on unnecessary electricity usage. 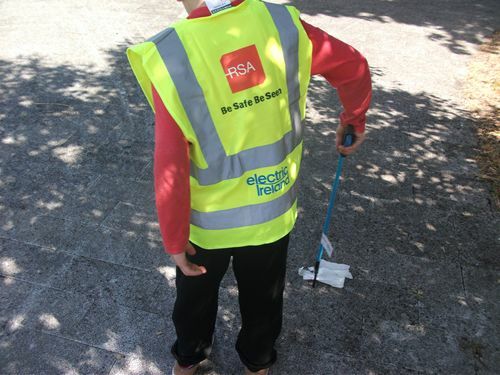 Shut down appliances fully when not in use – standby lights continue to use electricity. 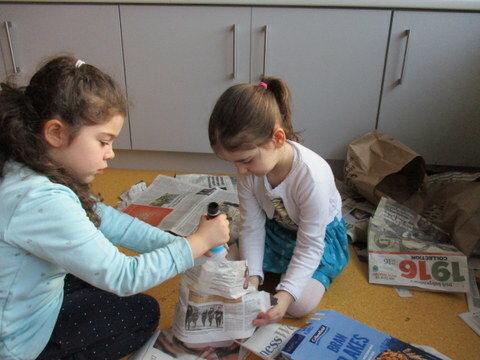 Choose the right lightbulbs – LED lightbulbs use 75% less electricity than incandescent bulbs. Switch off lights as you leave the room. 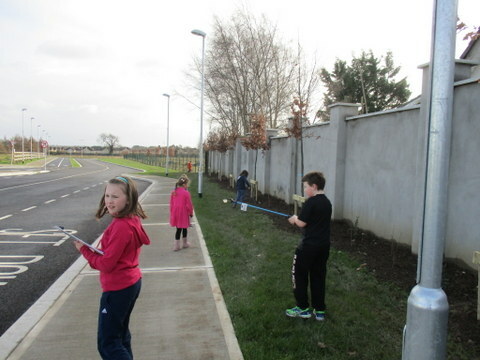 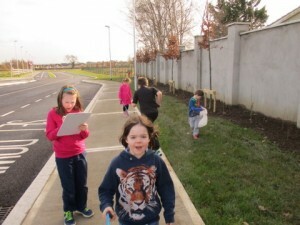 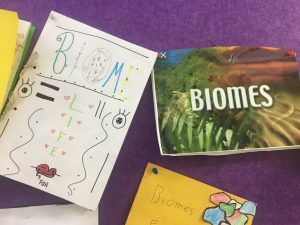 Sixth Class completed amazing projects about Biomes and the effects of climate change on biomes. 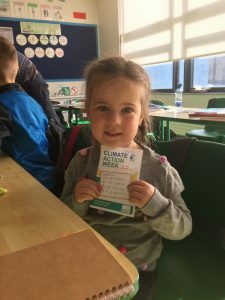 Climate Action Week ran from 15th-19th October. 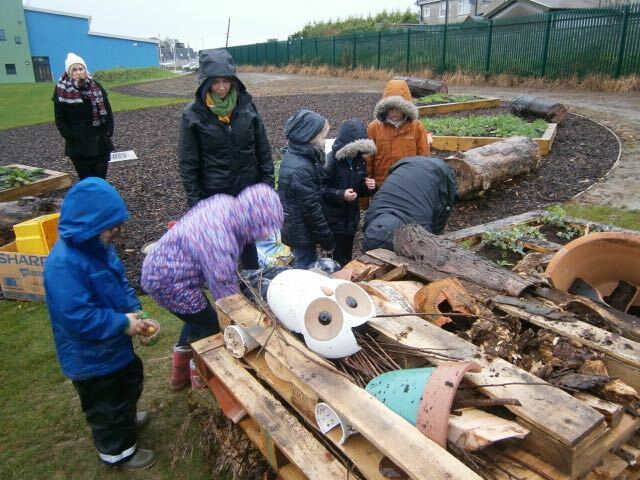 All teachers taught lessons related to climate change and the impact on our environment. 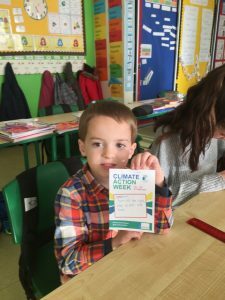 The Green School Committee learned all about climate change and they made climate action pledges of way they could help the environment. 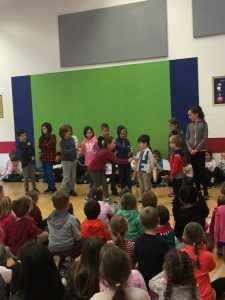 On Friday 19th October the Green school committee gave a talk to assembly all about climate change and what we can do to conserve energy and reduce waste. We had a competition to create a Green code for our work towards our Green Flag. 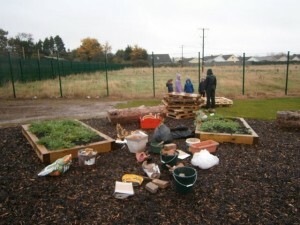 The Green Schools Committee had a difficult job choosing from entries from all classes. 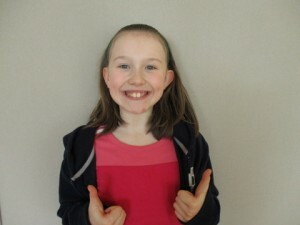 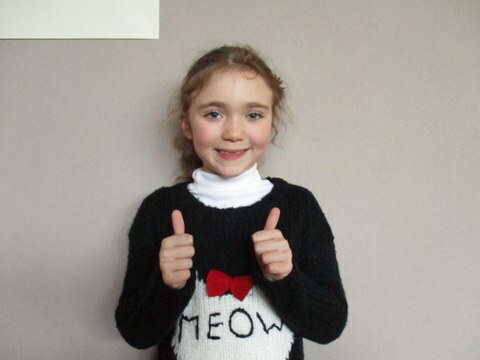 Julia and Alannah in Fourth Class designed and composed the winning entry which is now our Green Code. 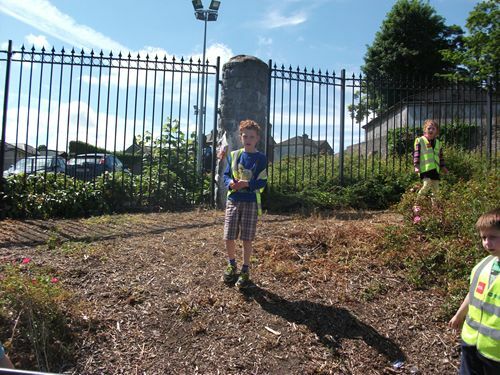 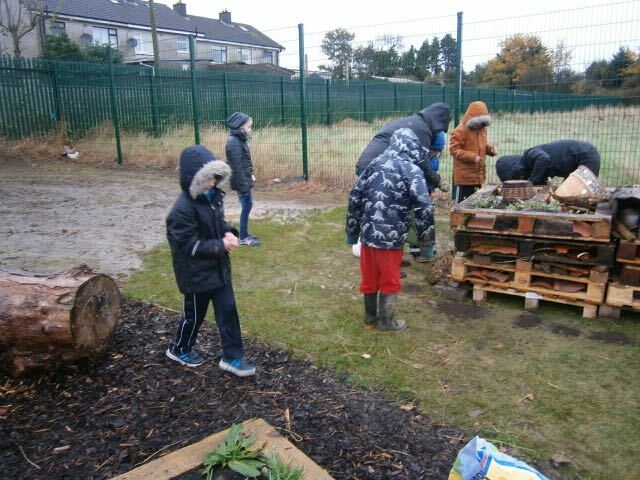 We noticed that there was some waste by the boundary wall recently so we decided it was time for a clean up! 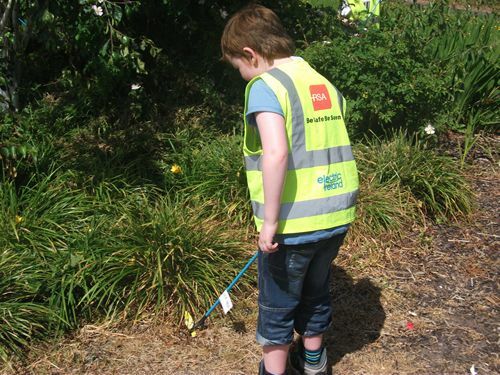 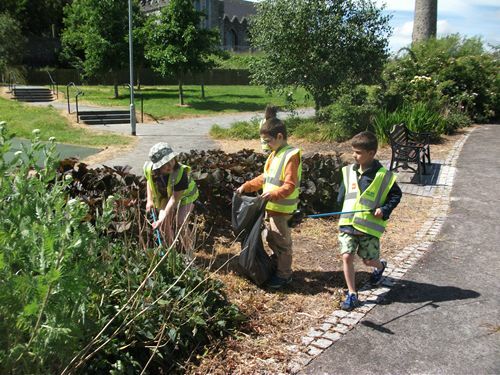 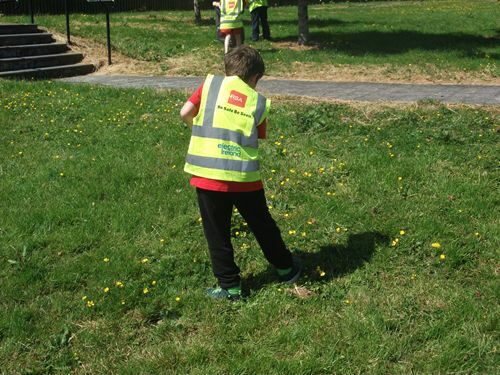 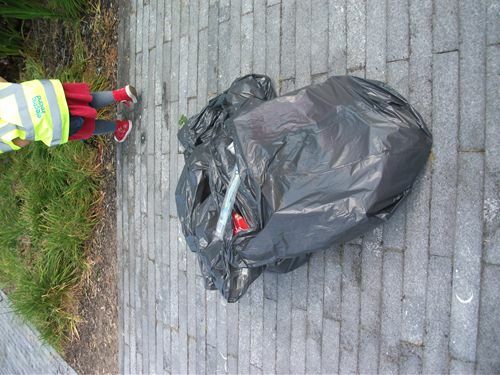 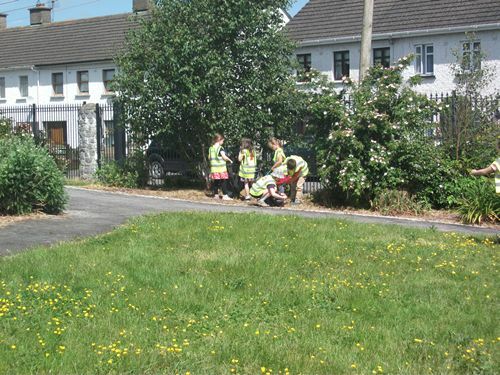 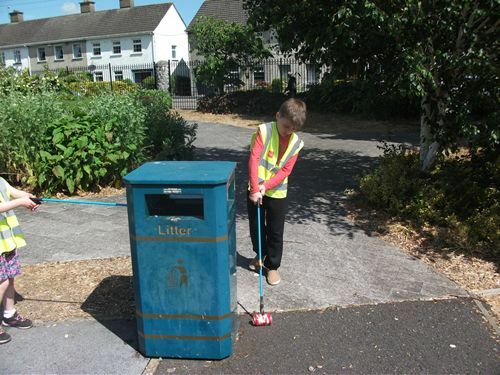 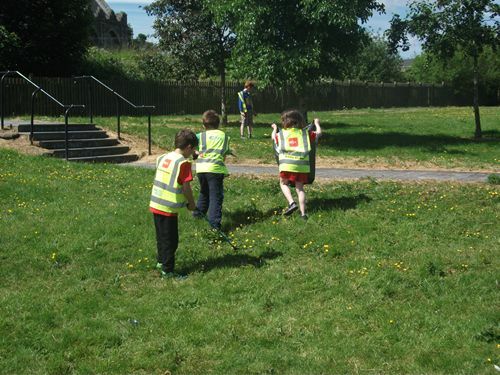 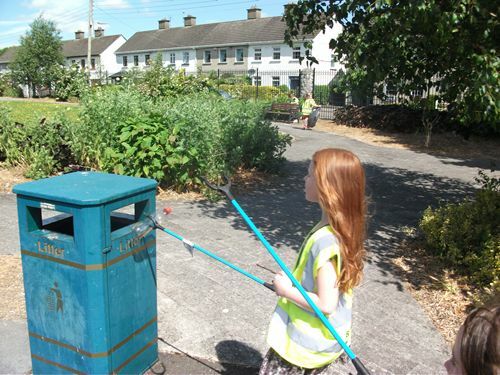 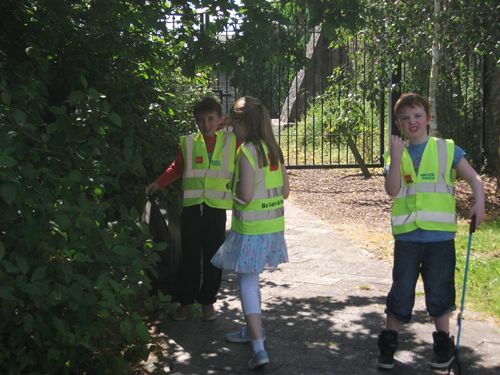 Some senior members from our green team, armed with litter pickers, bags and clipboards to record the waste collected, were busy this week making sure we keep our school clean and tidy! 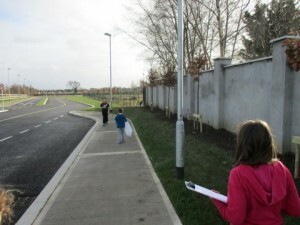 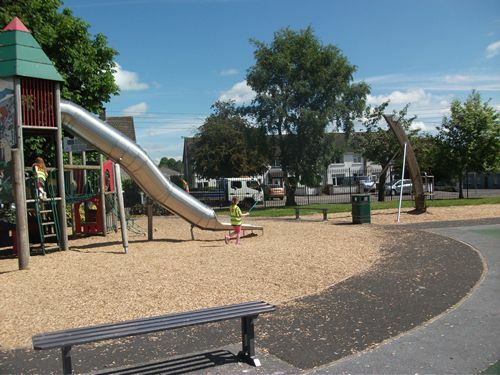 Now that we have done the clean up we will be monitoring the area closely each week. 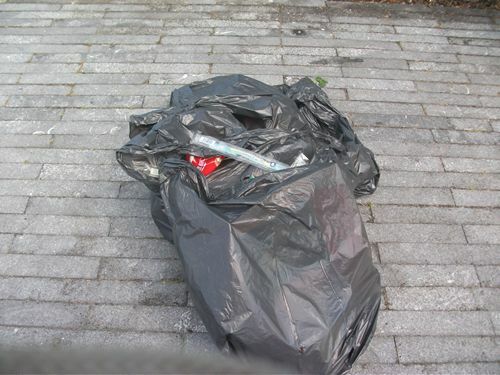 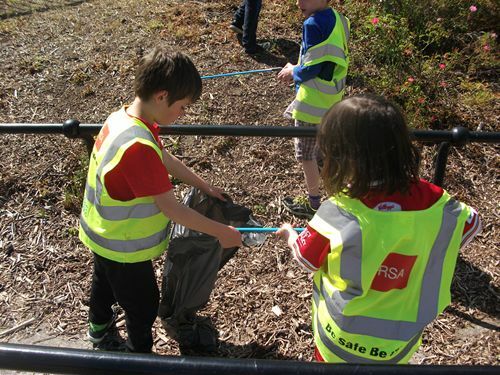 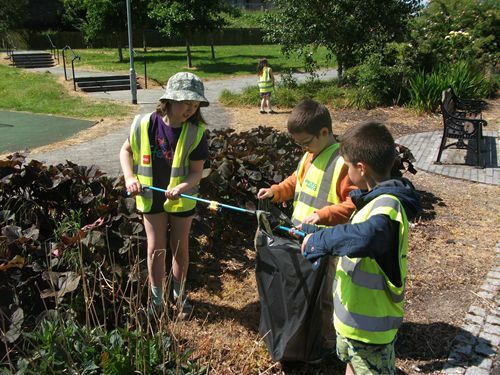 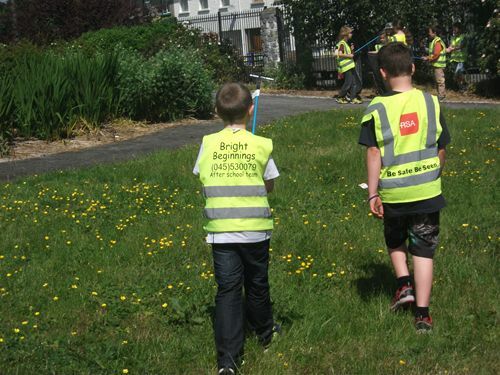 Luckily, the sun was shining and there was not too much litter! 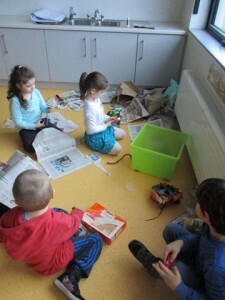 Our Green Team has expanded! 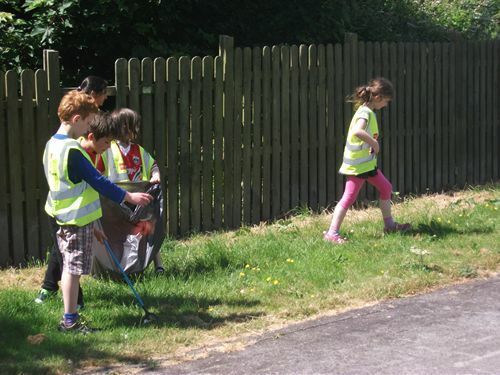 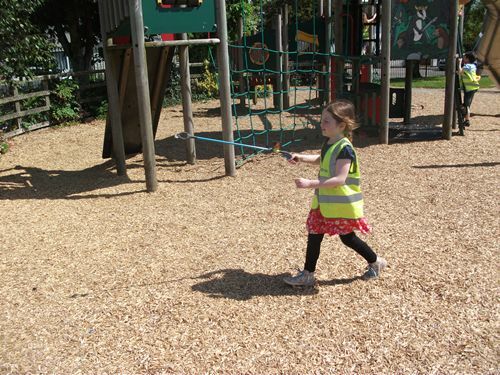 Junior and Senior infant children have now joined the Green Team! 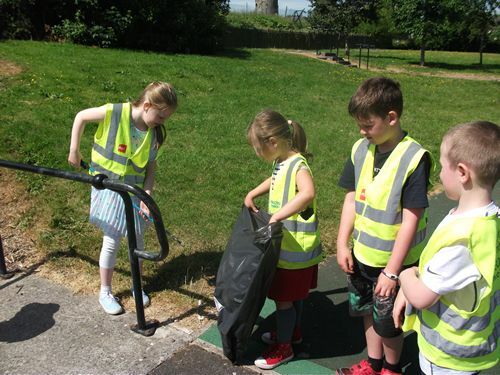 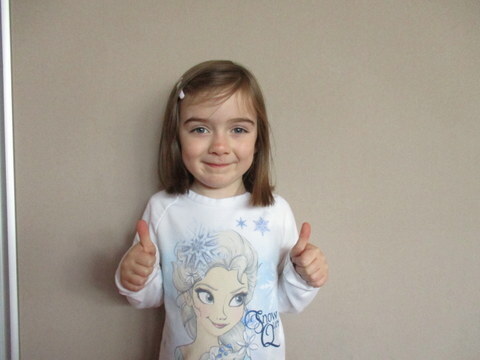 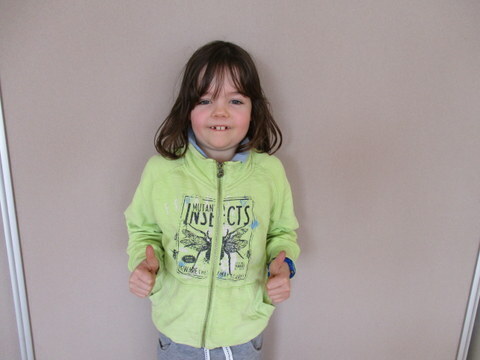 We are excited to announce that Jenny from Orla’s class, Caleb from Rosie’s class and Miia May from Christine’s class have now joined the Green Team! 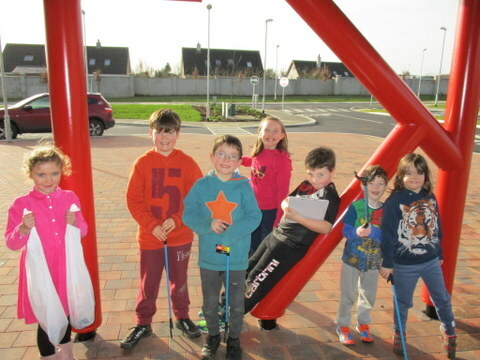 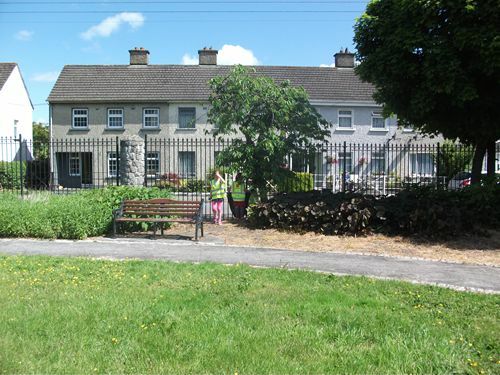 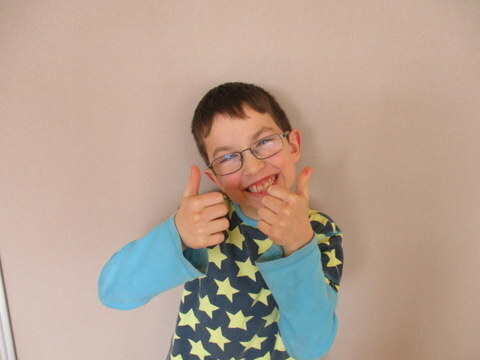 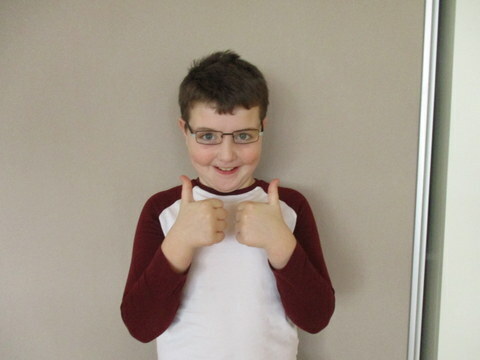 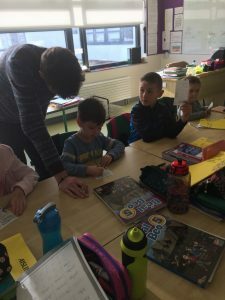 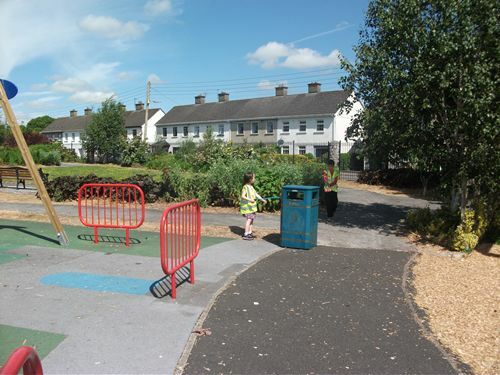 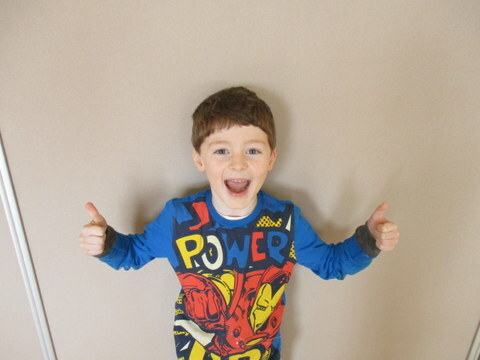 They will join Cormac and Aaron from Josh’s class, Katie Jennings, Katie O’Connor and Rian from Jonathan’s class and Aoibhe, Conor and Tommy from Aisling’s class. 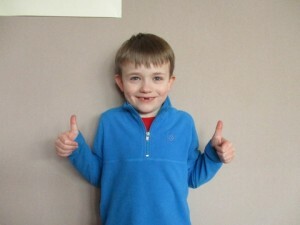 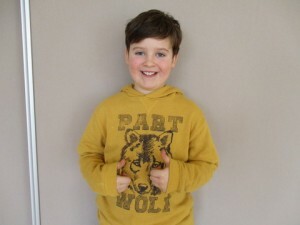 Tommy also represents Sarah’s class. 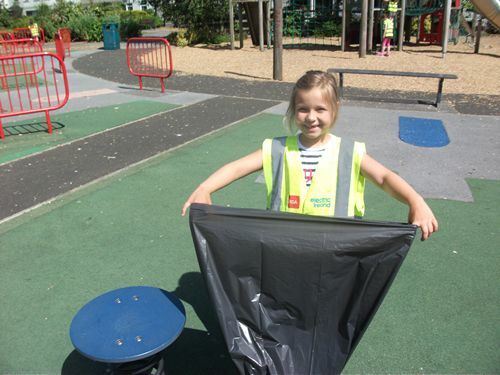 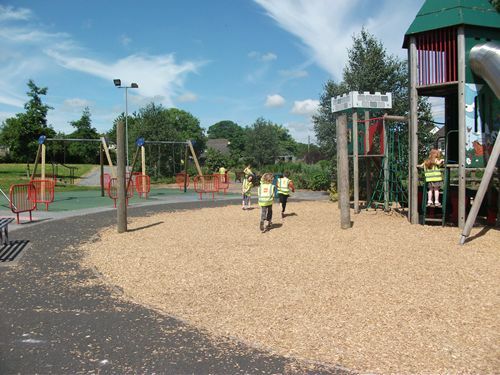 We are so lucky to have such a large group of children ready to work hard to ensure our beautiful new school stays litter free and we reduce our waste. Junior and Senior infants have been very imaginative in exploring ways to reuse waste from the staff room and parents room. 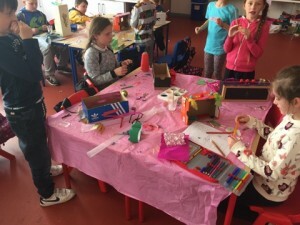 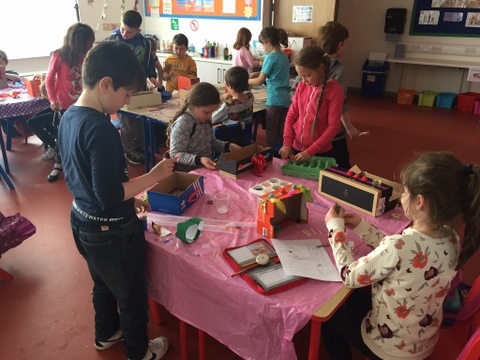 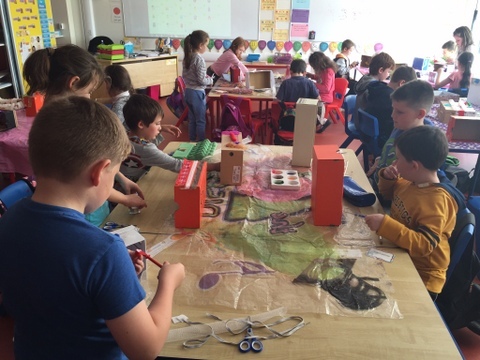 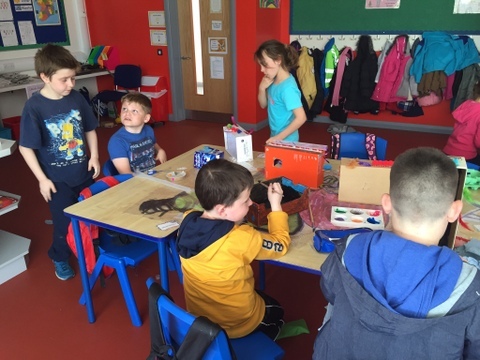 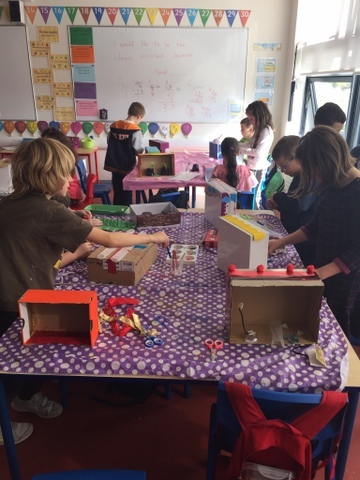 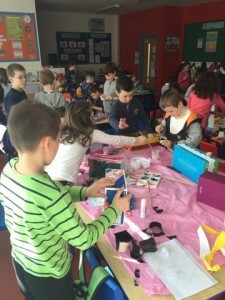 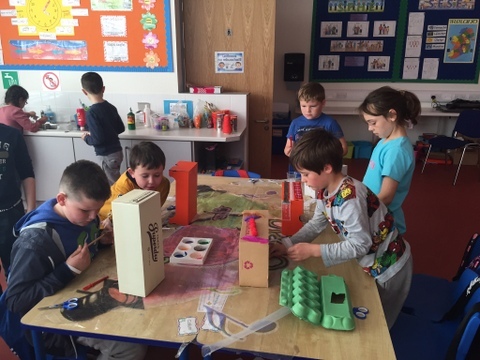 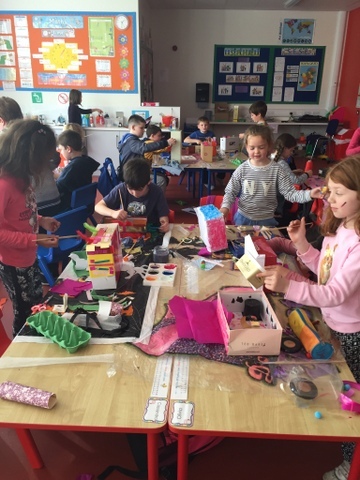 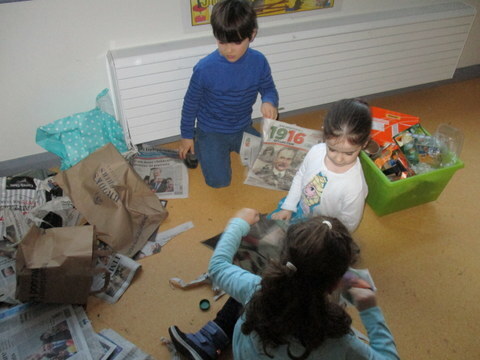 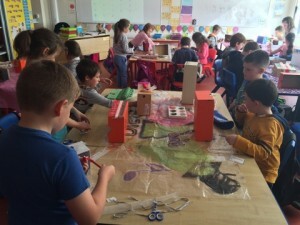 They have built castles, rockets, fairy houses and a whole range of other creative pieces in the Junk Art station during Aistear time. 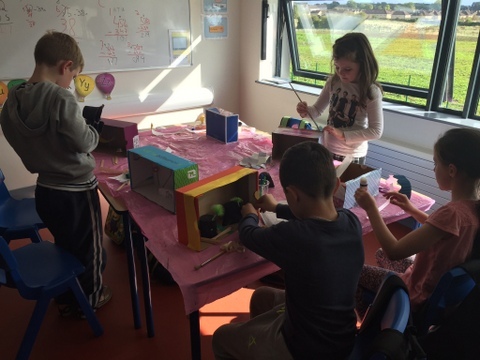 2nd and 3rd class have been busy this month making dioramas in Art lessons. 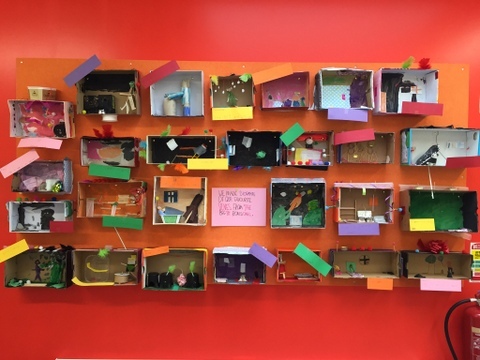 They have been really creative and made their dioramas by reusing materials. We think reusing materials to create art is a wonderful way to cut down on waste! 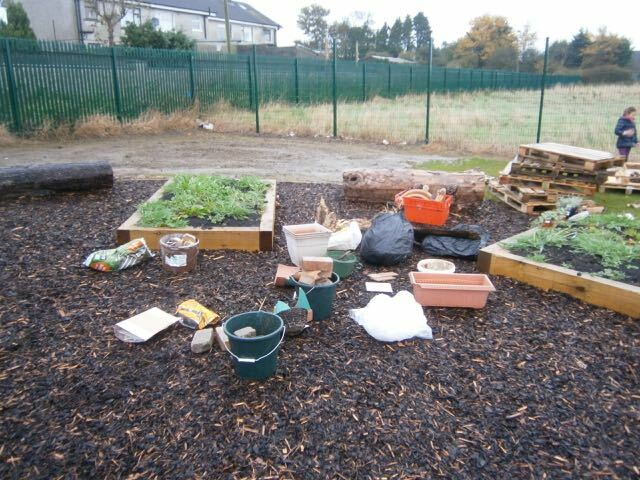 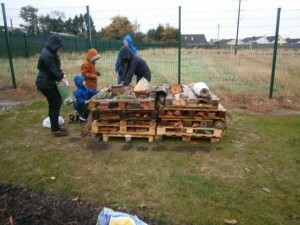 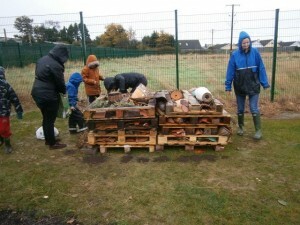 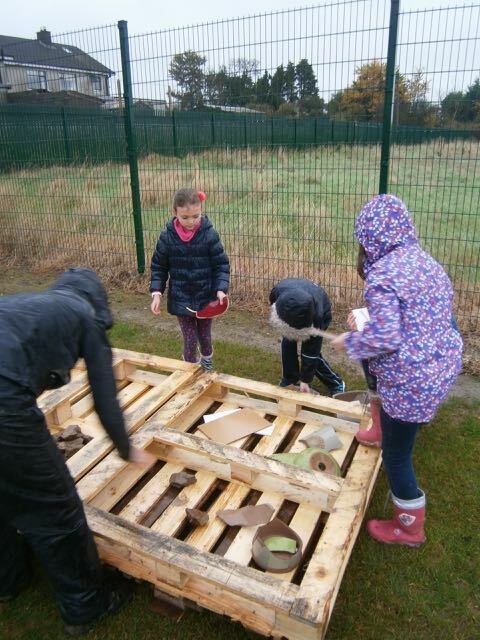 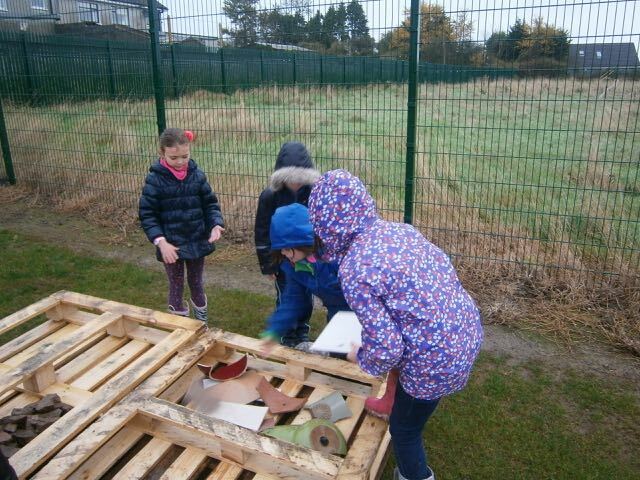 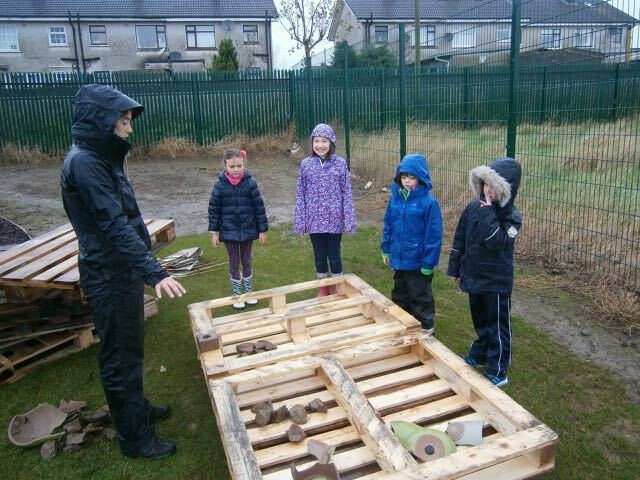 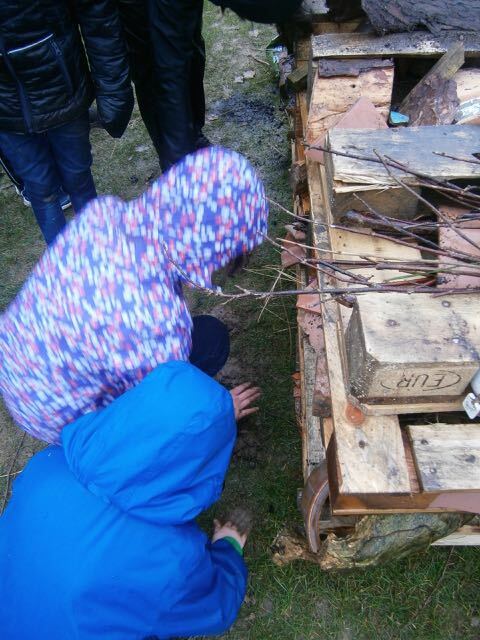 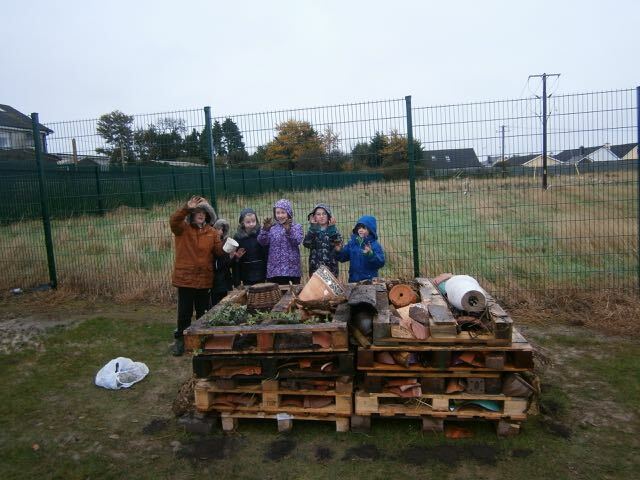 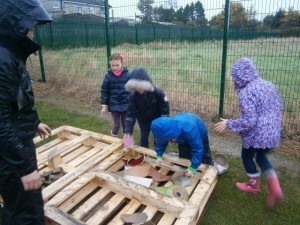 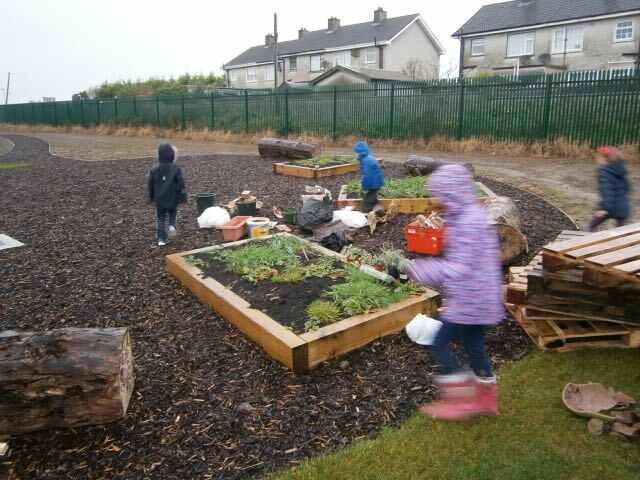 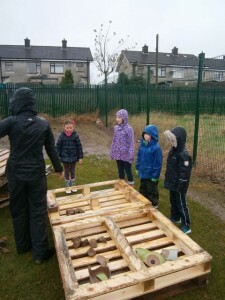 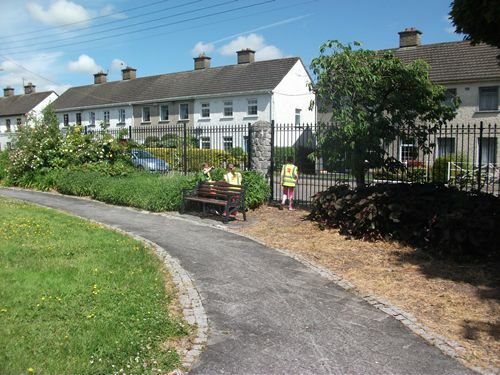 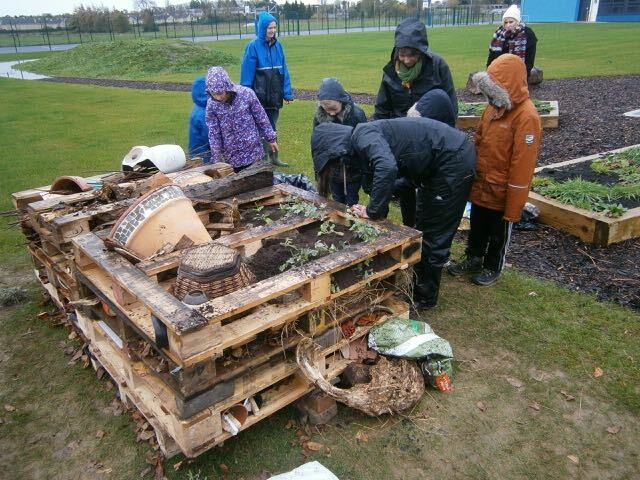 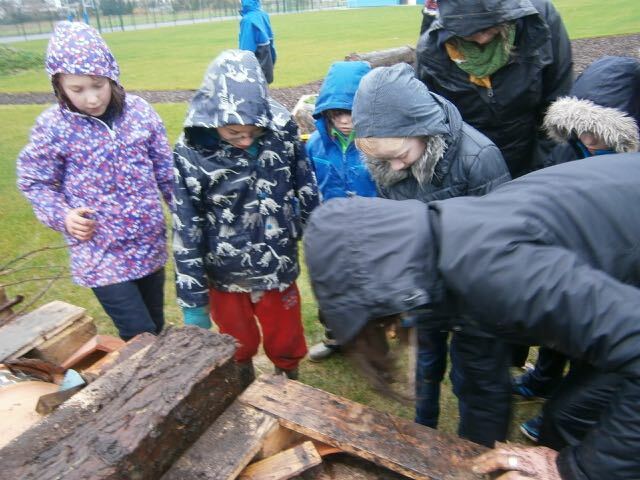 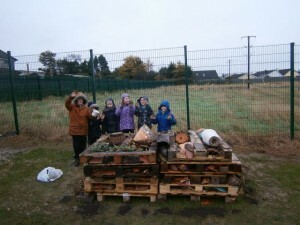 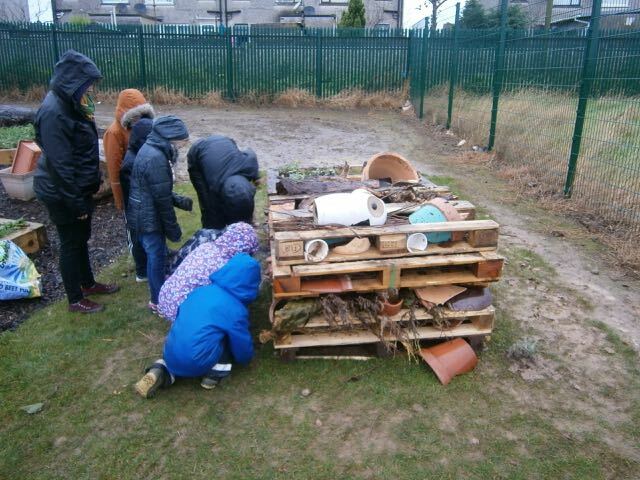 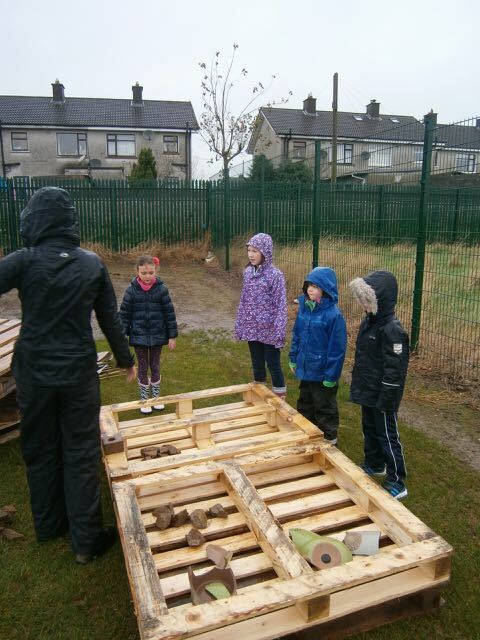 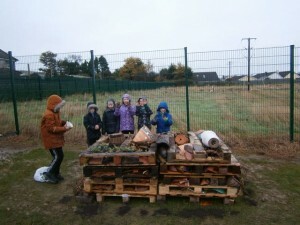 Last Tuesday we welcomed Kate and Lucy from Presentation Ecology Ireland to the school to help us make a bug hotel. 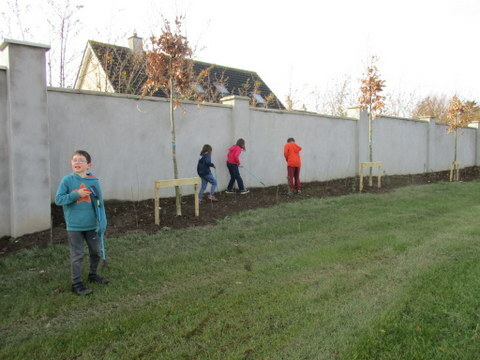 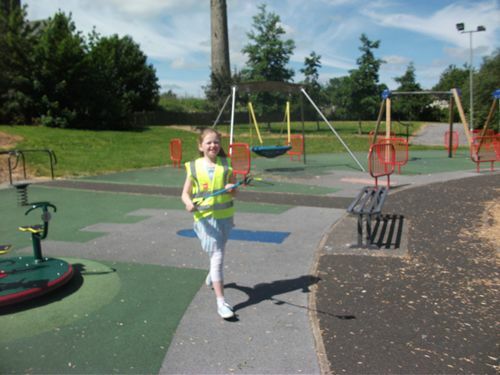 They were sponsored by Kildare Tidy Towns and we are very grateful to all involved. 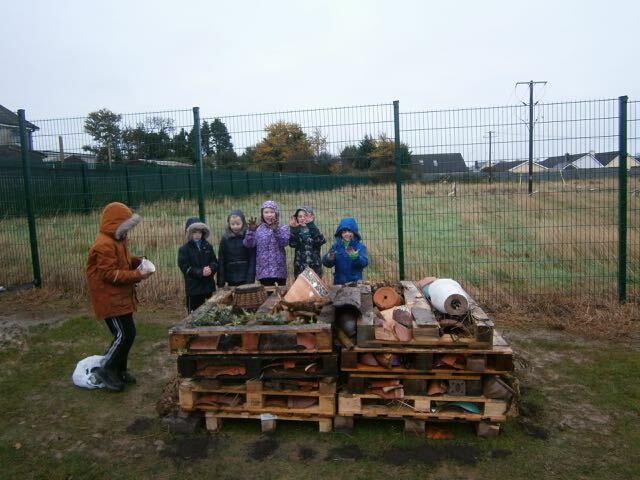 The children on the Green School Committee went out in the rain for several hours and built the bug hotel under Kate’s instruction. 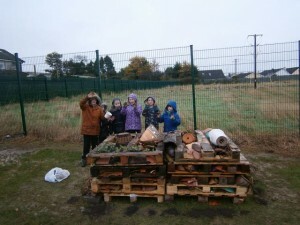 They created lots of different habitats for a large range of insects out of recycled materials. 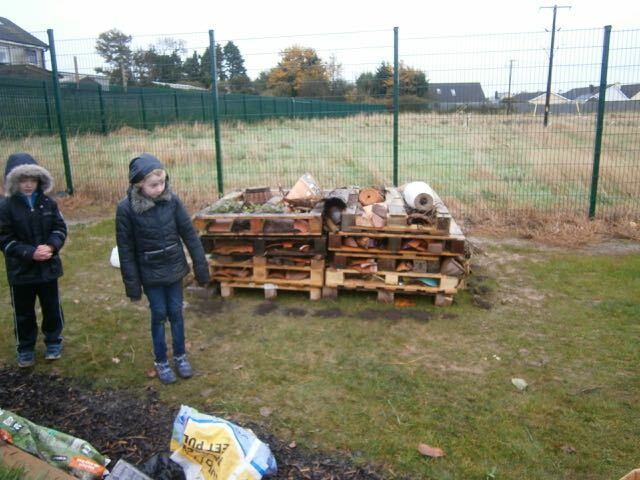 They also planted some bulbs around the base of the ‘hotel’ so that there will be some food sources for the insects when they emerge in spring. 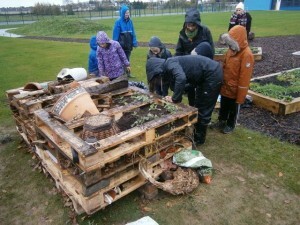 Once the building was finished we had visitors from Rehab who came to view the bug hotel with one of the classes. 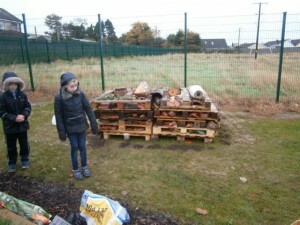 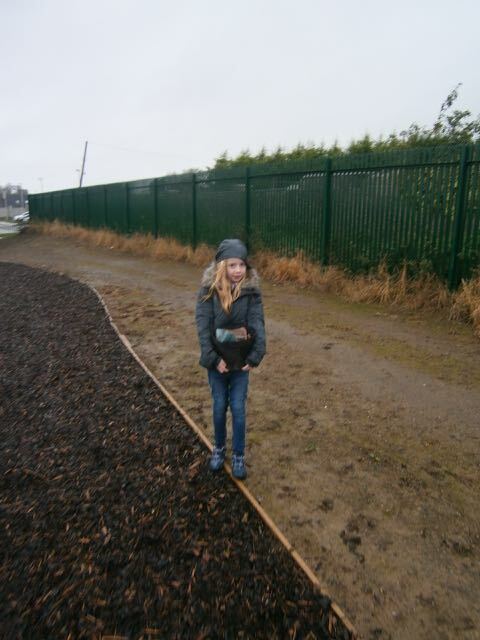 Kate and Lucy visited each class in the school and brought them out to view the new bug hotel. 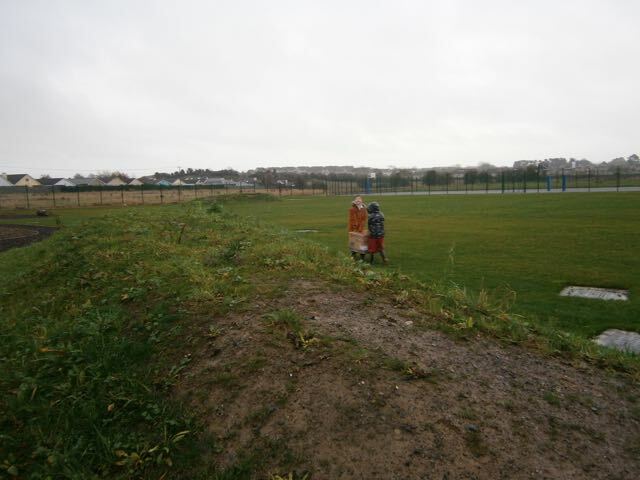 Thanks to them both for a lot of work on a very wet day.